Irregular pulses are morphing into a melodic harmonic story, each time a different one, each time a different plot, but every time – Egorythmia, aka Boban Lazovski. Egorythmia’s path has never gone in a specific pattern... His attraction to Psychedelic Trance began with deep dark tech Trance such as Dark Soho, the Delta , Atmos and Midi Miliz , and then went further back to old school Goa Trance such as Cosma , Man with No Name and Etnica… Being hypnotized by these astonishing sounds in his home at Skopje, Macedonia, he felt the need to take part in this mysterious culture and create his own psychedelic interpretation. And so, in the year 2001, he started to gradually penetrate into the culture, first as a DJ and party promoter, and then when the urge to bring his own mark increased, Lazovski started to make his own sound. 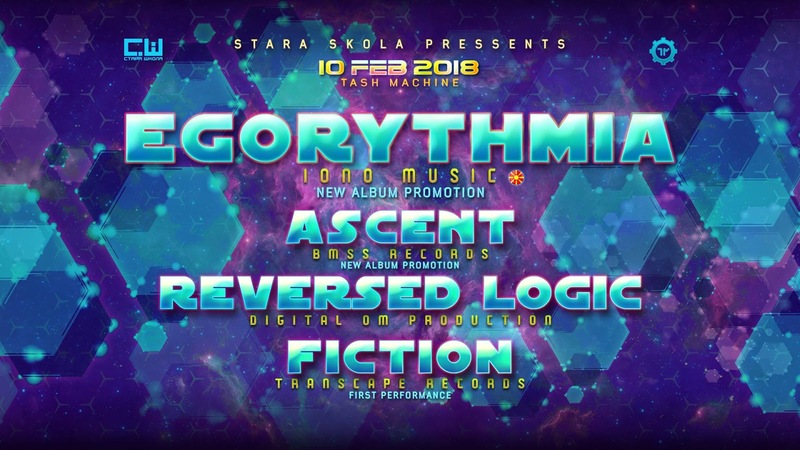 In 2008, Egorythmia has emerged into the world. Egorythmia has got the whole world hooked up on his music. Travelling all around the globe to spread his religion, he made stops in Boom festival, Fusion Festival, Ozora festival, Antaris festival, Vuuv Experience festival as well as making turbulences in Israel, Brazil, Mexico and Australia. Along the way he met many like-minded artists whom he collaborated with, such as Ace Ventura, Ritmo, Zen Mechanics, Symbolic, E-Clip, and Zyce. These collaborations and his music have been released in many labels, for instance Blue Tunes, Iboga, Echoes, and Plusquam. Always on the move, Egorythmia is fired up and his flame is going to get bigger and brighter. Follow the heat, follow the light. Ascent is Psy/Progressive project made by Bojan Stojiljkovic from Serbia. and producing,Ascent Project is born. emotional harmonies and ethno vocals.. In the past years, Ivan has been exploring different ideas about psychedelic music production and after some experimentation he has created Reversed Logic which brings forward a more fast paced and driving style of Psychedelic dance music. The framework of the music crosses over to the twisted psychedelic/forest side and at the same time keeping a strong Goa feeling alive through the leads and melodies. FICTION is Psychedelic Trance project of Nikola Peric (part of Makida project), from Belgrade, Serbia. After years of total devotion to Makida, Nikola had to put his solo carrier on a side. Now, when Makida’s fan base has grown strong and continues to conquer worlds Psy-Trance scene, he decided to activate his solo project as well. He’s debut EP “PsyNalysis” was released on Transcape records in May 2017 and was instant hit. 2nd EP “Remarkable Reality”, released under 24/7 records, already made noticable impact on Beatport Psy-Trance charts reaching top stops. Several mind blowing remixes and singles followed and he doesn’t plan to stop. With this new project, Nikola aims to bring good old times back, Psy-Trance like we had in 2000s. Distorted, twisting, powerful soundtracks with melodic main leads, strong ending message – that’s “FICTION”!